The upcoming No Man's Sky update, The Abyss, is all about what lurks beneath the ocean. No Man's Sky 's latest update, Next, has completely revitalized the game, not only reworking the visuals, but changing basic systems and adding to the much-anticipated multiplayer. The Abyss is not quite as huge, but hopefully the addition of underwater missions and vehicles will lend depth to the in-game waters, which are nowhere near as robust as the land. 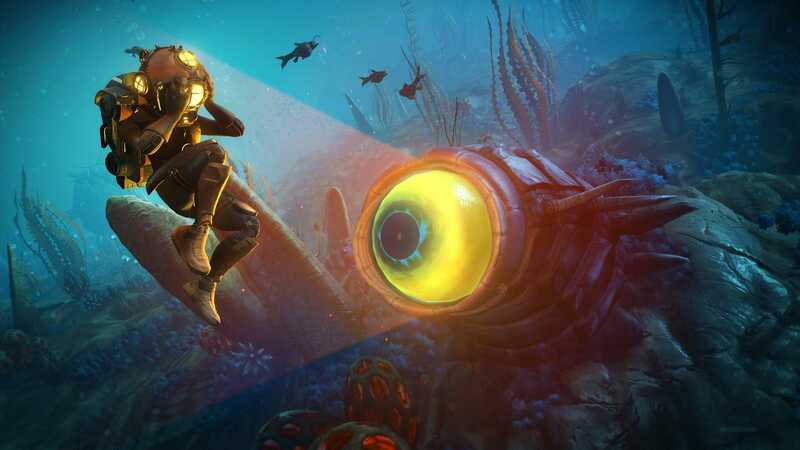 "We wanted to focus on improving the underwater world, and also on some of the scariest elements of the game for Halloween," said Sean Murray, co-founder of No Man's Sky Hello Games developer, in a press release today. "The oceans were always huge in No Man's Sky, but now they're a big, deep part of our gameplay." The Abyss changes the underwater flora and fauna and makes underwater creatures "more frequent and interesting". In addition, new underwater missions, sunken wrecks, new construction modules for underwater buildings and a submarine will be presented. I have largely ignored the oceans in my time with No Man's Sky so this update sounds pretty exciting. I can not wait to see which fucked fish are waiting for me.